A print is the result of that process which, by talking an impression from a matrix, makes it possible to reproduce several copies of identical work. The oldest print Technique is certainly the woodcut, in which the matrix is obtained by engraving a wood board. The ﬁrst examples ot this art form date back to 900 BC in lndia. By the time of the Sung dynasty 960-1279 AD),the woodcut had already reached a high technical level in China, and it would go on to enjoy a splendid period in 17’“ Century Japan as well, in the school of Ukiyo-e. The woodcut appeared in the west only towards the end of the 13″‘ Century. During the next century, Cennino Cennini remarks, in his Libro sull‘Arte, on the use of this technique to make prints on tabrics. – Subsequently, the Colpurteurs (travelling salesmen), wandering about the markets of Europe, disseminated the ﬁrst prints, of a simple, popular taste. Only towards the end of the l5′” Century did professional artists begin to give this means of expression due consideration. During those some years the introduction of paper into the west maicle it p.ossible for printmaking to become truly established, especially in the area of religious prints: some monasteries, in tact, became real centres for the production and dissemination of printed images. The use of an engraved steel plate as print matrix came later, a typically European invention. \/asari would claim the invention of this technique torthe Florentines, narrating how Maso Finiguerra, a silversmith, accidentally“ triansterred the impression of the decorations engraved on a tray to paper.’ Certainly during the second, half of the l5’“ Century, the use of the Niello was common among goldsmiths and silversmiths, that is, a rudimentary pnnting operation that made it possible to control the, quality at the execution and to preserve the patterns of works done. It is, therefore, easy to understand that the ﬁrst metal matrices for printing were made using typical goldsmiths teols, such as the bulino, which. nnaking a real groove in the metal, allows the artist to obtain lines of variable intensity on paper. depending on the pressure he exerts upon the tool. Areal turning point in the engraver’s art was had with the use of acids to etch the grooves in the metal: between 1514 and 1519 we ﬁnd Durer, the great German engraver, devoting his efforts, to research on acids, used at the time to engrave decorations on knights’ armour. But the credit goes; to Francesco lvtazzola, il Parmigianino. for having developed these techniques, having made, in 1520, the ﬁrst acquatorti or prints made with nitric acid as the etching ﬂuid. Thus was born a reﬁned system of “‘indirect“’ engraving which, engraves lines on the matrix, with an acid having the density and colour of water. Today this liquid is known as nitric acid, but it was known anciently as acqua forte or “strong water”. ln this technique the engraver works on a plate coated with a thin layer of wax, using pointed tools of various shapes and sizes K and sizes, to scrape away the wax and uncover the metal. When placed in the acid bath, the metal is eaten away were the wax has been removed. Systems by which the printmaker’s plate can be prepared have multiplied with time (acquaints, soft wax, black matter) and even today experts artists succeed in obtaining special effects using personal variations that result from small innovations in technique. 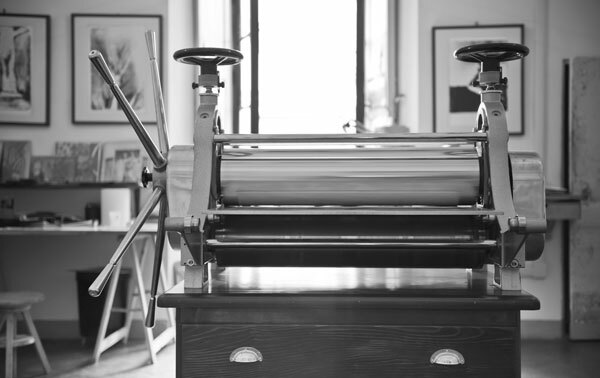 The acquafojrle, together with the copper-plate engraving systems that derive from it. is, unlike the lithograph and serigraph. a very ditﬁcult technique to counterfeit, and for this reason, it preserves its value~and prestige intact through the years. Despite this in the modern world, dominated by technology and by ammarket that is often totally lacking in scruples, in which many of the prints sold as originals are only photomechanical products of little economic and artistic value, it has become necessary to deﬁne exactly what an original print is, so as to safeguard the purchaser as well as the talent and dexterity of the artist. In December 1964, the Comite National ode la Gravure thought to do just with a deﬁnjition ratiﬁed by the Chambre Synclacale de l‘Estampe e du Dessin and published in the Nouvelle de l”Estampe in Februaw l965:”To be considered original, an engraving must be the print obtained, in black or in colour, from one or more matrices wholly drawn and engraved by hand by the artist himself, whatever the technique may be. to exclusion of all mechanical or photomechanical processes. Only prints that meet these requirements have the right to be called ORlGlNALPRlNT.